We are pleased to announce our integration for customers in Australia with PimpMyGadgets who offers a huge range of quality cellphone replacement parts & accessories products at extremely competitive prices. Please follow the step-by-step instructions to setup our integration with PimpMyGadget. In order to Integrate PimpMyGadget E-Ordering with RepairDesk POS, you will need an approved PimpMyGadget account. If you already have an approved account please login to PimpMyGadget website to generate API Token Key or you can apply for a new account here. 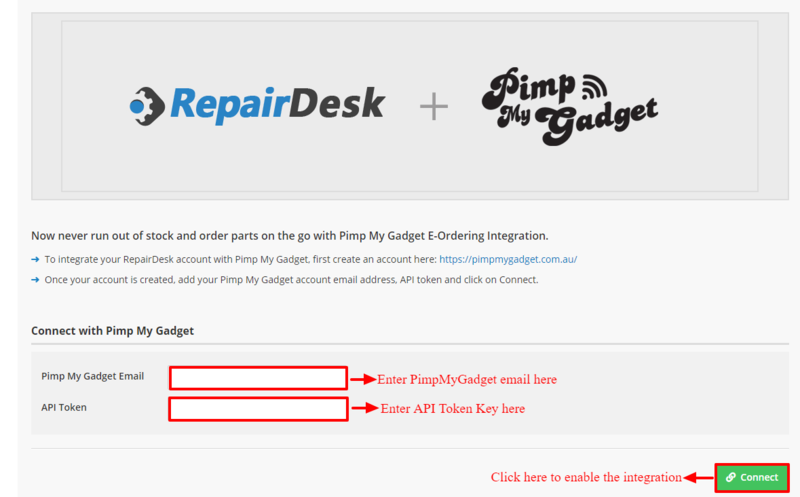 1- If you are logged in PimpMyGadget account, click on Account Information tab which will display your API Token Key. If the field is empty please type in random 8 digit alphanumeric code, copy it and save it on a text file as you are going to need it later. 2- Now Login to RepairDesk and click on PimpMyGadget under integrations. 3- Enter your email address and API token as shown below and click connect which will send account authentication request to PimpMyGadget website. 3. 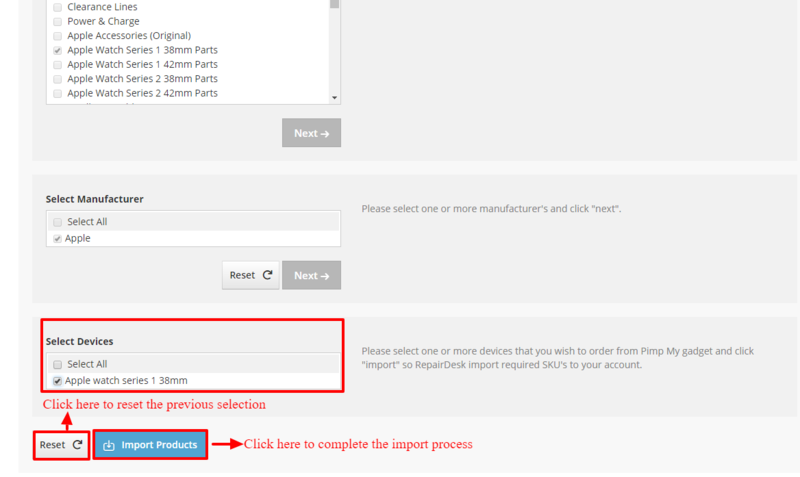 Select devices that you want to import and click "Import Products" which will start the import process. 4. This process will take few minutes and you'll receive an email once selected SKU's have been imported to your RepairDesk account. 5. To import items again, please use Run Import Wizard button to repeat import process. 1. Open low stock report and add selected items with desired quantity in purchase order. From purchase order screen you will be able to view real-time inventory levels from PimpMyGadget platform so you can adjust order quantity and will be able to checkout with a single click. 2. Alternatively you can create a new purchase order and select PimpMyGadget as supplier. 3. Search item(s) by name or SKU you want to order and click on add row. Once you add a new line item it will display real-time inventory levels from PimpMyGadget so you can adjust order quantity (if required). 5. Now click on Checkout with PimpMyGadget which will display a pop-up message and then click on "proceed to checkout" from where you can confirm your order. Click on Checkout with PimpMyGadget button and you will be directed to PimpMyGadget site where you can view the cart filled with items. Please select shipping and payment method from PimpMyGadget site to complete this transaction. Note: From PimpMyGadget website you can also add or remove items which will update purchase order on RepairDesk. Also once your order status is updated on PimpMyGadget website i.e. in progress, shipped it will automatically be updated on RepairDesk purchase order. Q. How can I add new items from vendor inventory list to RepairDesk? A. When any new inventory item is added to PimpMyGadget account, it will automatically be displayed in RepairDesk PimpMyGadget integration section. Under SKU List, new SKUs will be imported and you can add them to inventory by selecting the items and hitting Add to Inventory button. Q. 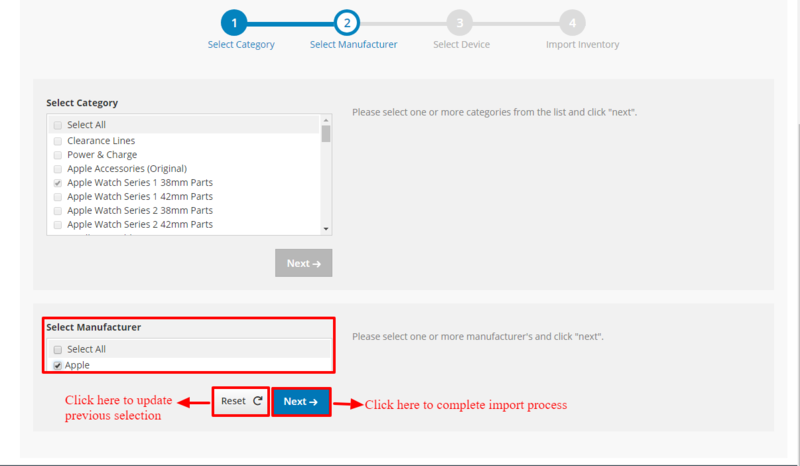 Can I select multiple categories, multiple manufacturers and multiple devices while running the import wizard? A. Yes that's absolutely possible to select multiple categories, multiple manufacturers and multiple devices during the import process. Q. When a new SKU is added on PimpMyGadget Website can I get a notification alert within RepairDesk? A. Whenever a new SKU is added on PimpMyGadget website, you will receive an alert within RepairDesk so that you can add new SKUs in your inventory with few clicks. 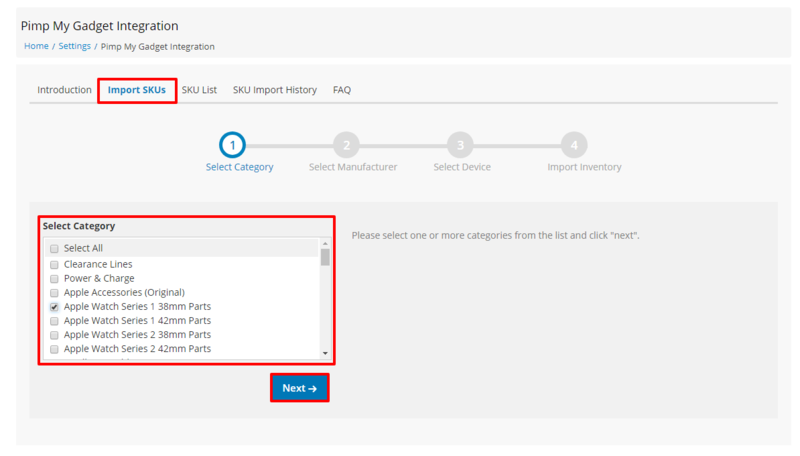 this will redirect you to integration page where you can select SKUs and add them in inventory.